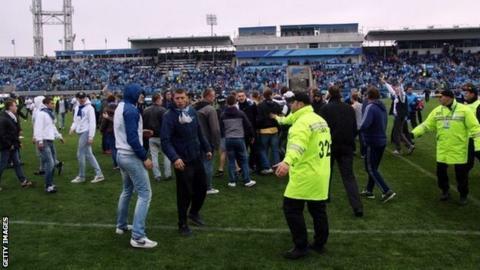 Zenit St Petersburg's match against Dynamo Moscow was abandoned following a pitch invasion by their fans on Sunday. The home supporters ran on in the 87th minute with their club losing 4-2 in a game that could cost them the Russian Premier League title. Zenit manager Andre Villas-Boas, the former Chelsea and Tottenham boss, went on to the pitch in an attempt to stop the trouble. Dynamo captain Vladimir Granat was punched in the head by a Zenit fan. The 26-year-old Russia defender, who could go to this summer's World Cup, suffered concussion. "At present the police and the club are trying to find the fan [who hit Granat] and we are preparing evidence for a criminal case." Two years ago, the same fixture was abandoned after a Zenit fan threw a flare which hit Dynamo goalkeeper Anton Shunin. Dynamo were awarded a 3-0 win. Zenit began the match one point ahead of Lokomotiv Moscow, who play Rostov later on Sunday, with two games left. Villas-Boas has only been in charge of Zenit for two months, having replaced Luciano Spalletti in March. Speaking about his captain being punched, Dynamo head coach Stanislav Cherchesov told local TV: "I would not want to play. If I was hit, would you force me to go back on to the field? "The player was hit in the face a few times and he says 'I don't want to go back out there'. What can you do?"